1:35 Thursday Update… WE ARE RACING!!! IT IS RACE DAY! Herald & Review 100 On Tap Thursday, July 7th! The 36th Annual Herald & Review 100 is here. 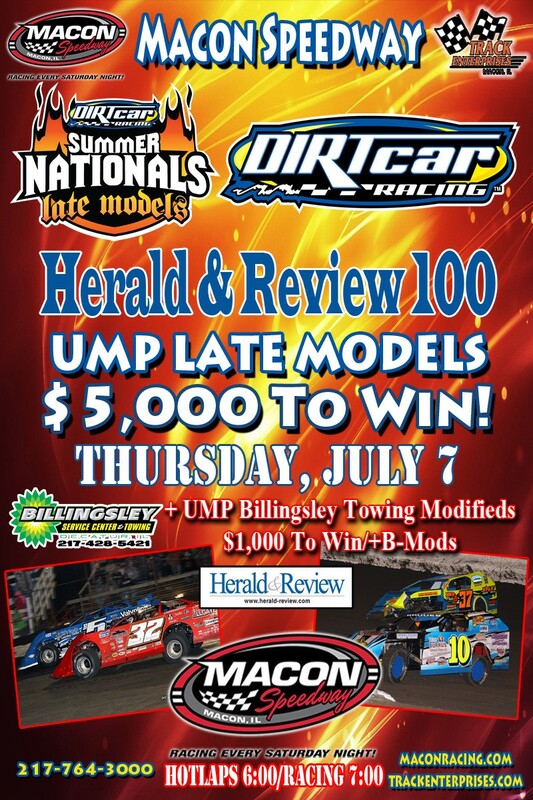 The cars and starts of the DIRTcar UMP Summer Nationals are ready to do battle for 100 laps around the 1/5 mile bullring to try and add their name to the longest running event on the Summer Nationals schedule. The Summit Racing Equipment Modified Nationals will also be in action as part of their month plus long journey that is very similar to the Summer Nationals in total length. B Mods round out the show. Come and see who adds their names to the history books as winners at Macon Speedway on one of the biggest nights all season long!